On Spring Street, just a few blocks from the Ohio River, the aroma of cinnamon candy bubbling in an antique copper kettle wafts onto the sidewalk, luring passersby into Schimpff’s Confectionery. As a ploy to hook potential customers, the fifth-generation family business in Jeffersonville, Indiana even has a pipe that blows out the tantalizing smell from its storefront kitchen to the street. Warren and Jill Schimpff call it olfactory advertising. 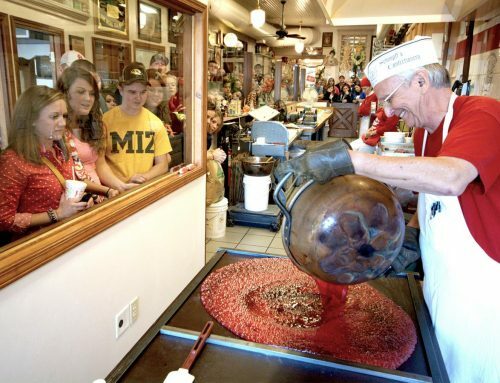 Groups that drop by Schimpff’s get a free demonstration of how the store’s signature cinnamon red hots are made, starting with a boiling concoction of sugar, corn syrup, red coloring and precious cinnamon oil (at $50 a bottle). Then the molten mass is poured onto a metal table before the pieces are formed by a molding machine and dusted with sugar granules. Everyone in the audience gets a warm sample. Schimpff’s also is known for its “fish” hard candy (flavors like butter rum, clove and spearmint), horehound drops and a whole range of chocolates, including bourbon balls, “turtles” and the hand-dipped Modjeska, a caramel-covered marshmallow treat named after a Polish-born actress. The vintage store, with an original tin ceiling and old-fashioned soda fountain, claims to have the country’s largest collection of candy industry memorabilia on public display, with some items in its back-room museum dating to the 1860s. Schimpff’s also serves lunch and has plans to double the seating area. For nostalgia in downtown Columbus, a must-stop is Zaharakos Ice Cream Parlor and Museum, a beautifully restored relic of yesteryear. “Serving sodas, sundaes and smiles for over a century,” this local institution is the place to have a Green River soda made with syrup and carbonated water dispensed from one of the two elaborate Mexican onyx soda fountains purchased by the Zaharakos family from the 1904 St. Louis World’s Fair. The exquisite 1911 double back-bar, with its mahogany, mirrors, marble and stained glass, sets the scene, as do the long onyx counter, 1905 Tiffany-style lamp and melodious sounds emanating from the 184 pipes of the 1908 Welte Orchestrion, a self-playing organ. The maple floor, oak cabinets and tin ceiling are original, too. Columbus businessman Tony Moravec stepped in to save the aging landmark (founded as a candy store in 1900 by three brothers from Greece) after it closed in 2006 and today Zaharakos shines anew, gloriously reflecting an era when women’s skirts reached to the ground and men had handlebar moustaches. 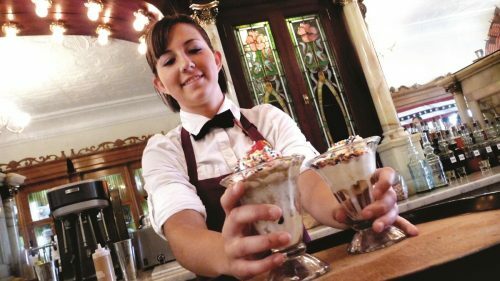 Groups can arrange a tour of the mechanical music instruments and the country’s largest collection of pre-1900 soda fountains on public display. They can have a meal or make-your-own sundae event in the museum area or upstairs in the sky-lit Green River Room. 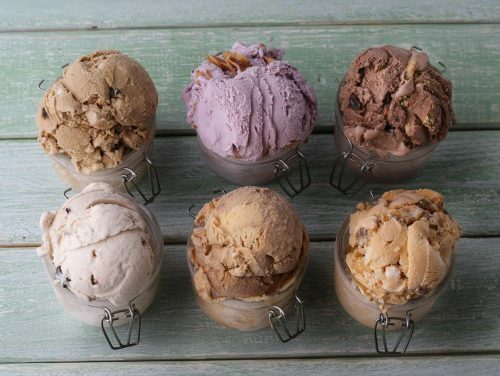 The premium ice cream is made fresh at Zaharakos, which also dishes up breakfast, lunch and dinner. (Did you know that Indiana is the second-largest producer of ice cream in the nation, after California?). For heavenly treats made of rich milk fresh from old Bessie, visit the Cowfé at Northwest Indiana’s group-friendly Fair Oaks Farms. The milkshakes and homemade ice cream—everyone talks about the butter pecan—seem to taste better than anywhere else. Another idea: Chocolate milk and a grilled cheese sandwich made from farm-fresh artisan cheese. Top off a hearty meal of fried chicken at The The Farmhouse Restaurant with desserts like apple walnut cobbler, cookie dough pizza, or Belgian chocolate and raspberry bread pudding. Witnessing the birth of a calf in the Birthing Barn highlights a tour of this working dairy farm, the largest in the U.S.
At the South Side Soda Shop & Diner in Goshen, a college town in Northern Indiana Amish Country, enjoy sundaes and other fountain creations along with a big scoop of 1950s schmaltz. And don’t forget the pies, from peanut butter crème and coconut crème to blueberry crisp and cherry red raspberry; the lemon meringue was featured on the Food Network’s Diners, Drive-Ins and Dives. A short drive down Main Street takes you to Olympia Candy Kitchen, the “Sweetest Little Place in Town Since 1912.” At the small soda fountain, have a chocolate malt or Goshen College sundae (maple syrup, marshmallow, chopped nuts) or quench your thirst with a Green River, cherry phosphate or grape lemonade. The hand-dipped chocolates made from scratch, like turtles and chocolate-covered cherries, are what put the family-owned business, started by a Greek immigrant, on the map. 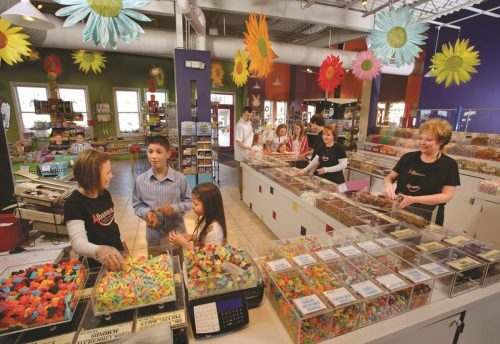 Also in Amish Country, the Wakarusa Dime Store, a charming slice of the past in downtown Wakarusa, is known for its jumbo jelly beans, and you’re free to sample the flavors, which range from cotton candy to root beer. Candies also include homemade chocolate and fudge, plus Turkish Taffy, Necco wafers, candy cigarettes and other favorites from way back when. You can’t go to Amish Country without digging into a family-style chicken dinner at a place like Blue Gate Restaurant in Shipshewana, Amish Acres Restaurant Barn in Nappanee or the huge Das Dutchman Essenhaus in Middlebury, the largest restaurant in Indiana (seating over 1,100). Your meal comes with a generous slice of pie, but the hard part is choosing from the more than two dozen varieties—German chocolate, Dutch apple, butterscotch, pecan, rhubarb…. the list goes on and on. These big, group-friendly restaurants have attached bakeries where you can buy some decadent desserts to bring home or eat on the bus. 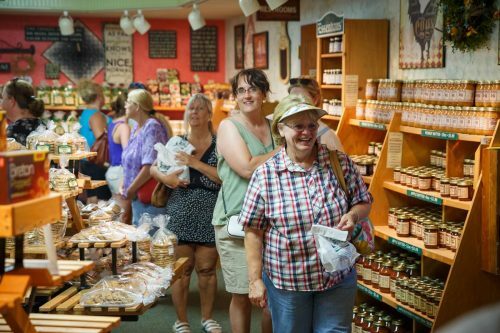 Amish Country guests also can find delicious baked goods at little stores tucked down country lanes, but perhaps the best-known stand-alone bakery is Rise ‘N Roll Bakery & Deli in Middlebury, famed for its cinnamon caramel donuts, cinnamon rolls, giant cookies and cashew crunch candy. It’s also a good place to pick up a jar of Amish peanut butter (sweetened with corn syrup and marshmallow creme), sometimes called church spread. Sugar Cream Pie is the official state pie of Indiana. It can be found in restaurants and bakeries in Amish Country and all over the state. A simple mixture of cream, sugar, flour, cornstarch, vanilla and butter or shortening, the smooth velvety pie, pale yellow in color and usually sprinkled with nutmeg, is said to have originated in the kitchens of Amish and Shaker settlers in the 1800s. It’s been called “desperation pie” because it could be made when fruits were unavailable and be whipped up quickly for unexpected guests. 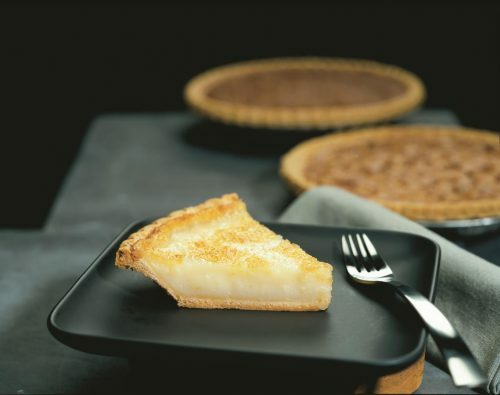 Also called Hoosier pie or “old-fashioned cream pie,” this melt-in-your-mouth classic is likened to a chess or buttermilk pie. Wick’s Pies, Inc. in Winchester makes more sugar cream pies than anyone—try a slice at Wick’s restaurant in Winchester or check out the factory outlet store. You’ll also find Wick’s pies in grocery stores and restaurants around the state. Among other places to try sugar cream pie—The Falls Restaurant at Clifty Inn in Clifty Falls State Park in Madison, Nashville General Store & Bakery, Ahlemeyer Farms Old Tyme Bakery in Columbus and Lisa’s Pie Shop in Atlanta. A fun note on Lisa’s: Her famous Pie in a Jar makes it easy to grab some varieties for the road, crust and all. For donuts, look no further than Titus Bakery, which has locations in Lebanon and Westfield. They’re best known for the Pershing, a yeast doughnut with swirled cinnamon dough and maple icing. The maple-bacon doughnut is topped with two full strips of bacon. Lovers of quality baked items also gravitate to Bread Basket Cafe & Bakery in Danville. Owned and operated by three generations of Indiana women, this community favorite is based out of a 100-year-old bungalow, with the living room serving as a dining area suitable for group lunches and breakfasts. Anyone who has been down a supermarket’s baking supplies aisle knows the iconic Clabber Girl brand of baking powder. If you’re in Terre Haute, why not drop by the Clabber Girl Bake Shop & Museum, located in the historic Hulman Building. Groups can arrange a museum tour and combine it with lunch and a cooking demonstration in the Classroom Kitchen. The cafe menu includes house-made cookies, muffins, scones and Danishes. Tempting breakfast choices are the cinnamon roll and the biscuits and gravy with buttermilk biscuits. If the name Hulman looks familiar, it’s the same family that owns the Indianapolis Motor Speedway and created the IndyCar Series. 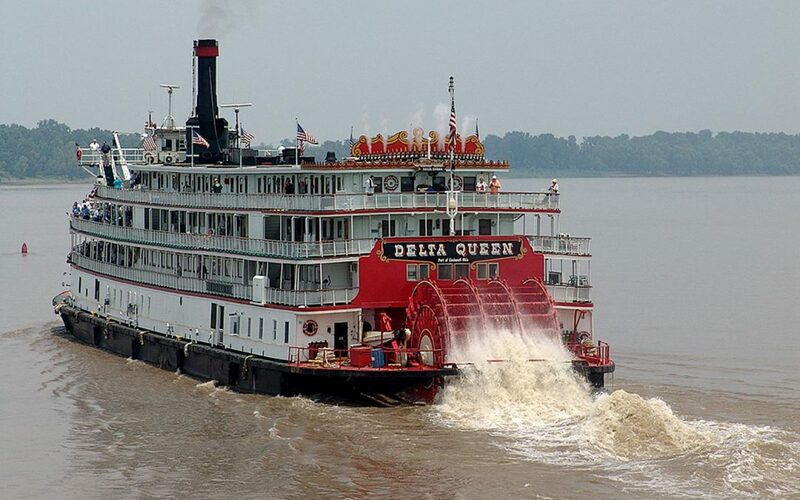 Hulman & Co. has manufactured Clabber Girl baking powder since 1899. A luscious dessert is the perfect way to top off a meal at one of the much-talked-about restaurants in the Ohio River town of New Albany, which in recent years has become a big foodie destination. If you like bread pudding, try the peach and brandy variety at The Exchange Pub + Kitchen or the bourbon version at new sister restaurant Brooklyn and the Butcher; both occupy restored 1870s buildings. At Tucker’s American Favorites, a steak and ribs restaurant, save room for The Cookie Experience, a giant, baked-to-order chocolate chunk cookie with a heaping scoop of vanilla bean ice cream, topped with chocolate and caramel sauce. Rookies Cookies, a bakery that opened in 1939, is famous for a small butter cookie with an icing center so soft that it melts in your mouth. Another sweet option in New Albany (and nearby Jeffersonville) is The Comfy Cow, which locals adore for its small-batch ice cream that’s high in butterfat and made with superior ingredients. Popular flavors are bourbon ball, brown butter peanut brittle and salted caramel. Soda pop connoisseurs who long for the good old days will be in dreamland at Antiqology, an antique store/ice cream parlor in Huntington that offers hundreds of vintage pop varieties from around the country and the world. The Midwest’s largest selection of craft sodas includes hard-to-find brands of glass-bottled cream sodas, root beers, colas and fruit-based drinks. Try unusual flavors like lemon meringue, caramel apple and blueberry pomegranate. Chocoholics will find many places in Indiana to satisfy their cravings. 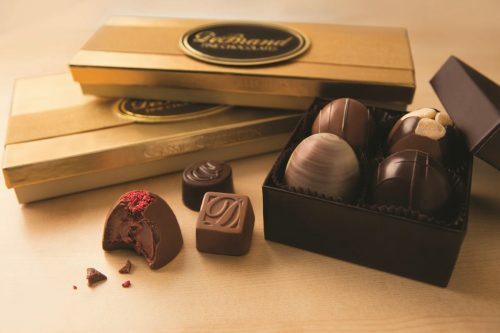 DeBrand Chocolatier in Fort Wayne, for example, produces some of the finest chocolate in the country—intricately designed works of art crafted with top-quality, sometimes exotic, ingredients. The truffles are silky and rich, the fruit creams burst with intense flavors. They even make gourmet gelato. On guided tours that let you peek beyond the glass and into the kitchens, perhaps you’ll see caramel pretzel bars being en-robed in chocolate or a stream of raspberry truffles on the conveyor; chocolate samples are part of the tour. Afterwards, guests can peruse the chocolate shop or relax over gelato, a sundae or fancy hot chocolate in the elegant, wood-paneled cafe. Boxes of DeBrand chocolates, distinguished by upscale packaging, are shipped all over the world. The chocolate trail also goes through South Bend, home of the South Bend Chocolate Company as well as the University of Notre Dame. 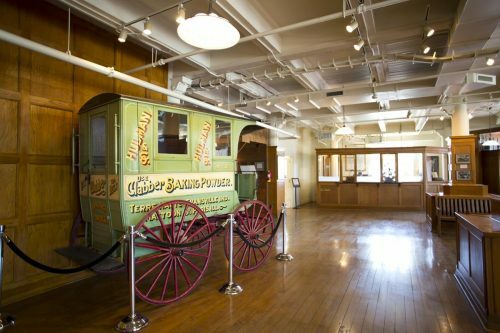 A factory tour includes the museum, which boasts one of the largest collections of chocolate memorabilia in the world. 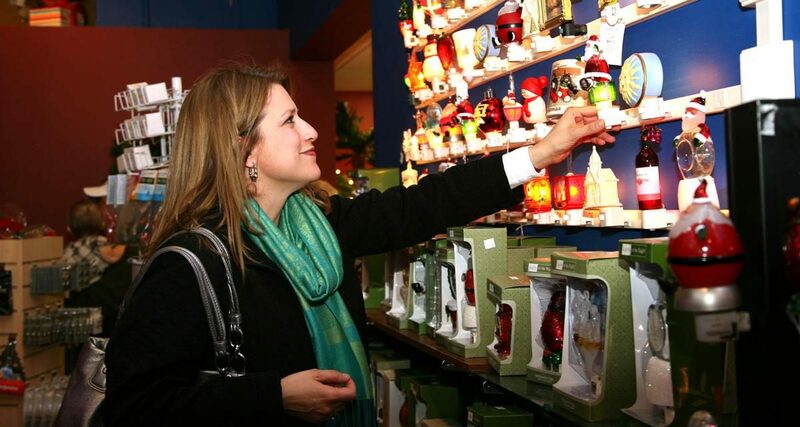 Check out the outlet store or the company’s downtown cafe, billed as the “world’s largest chocolate store.” The University Collection has products bearing the Notre Dame logo. Pay tribute to legendary coach Knute Rockne by buying a box of Rocknes, a mound of premium American chocolate blended with coconut, almonds and a cherry flavoring. Since 1966 Donaldson’s Finer Chocolates in Lebanon has attracted connoisseurs with top-quality products made the old-fashioned way—with fresh creamery butter, rich whole milk, pure cane sugar, the best chocolate and lots of Hoosier pride. George and Peg Donaldson make seven different flavored truffles and eight different creams, but their top seller is the Pecan Carmel Delight (comparable to a turtle). 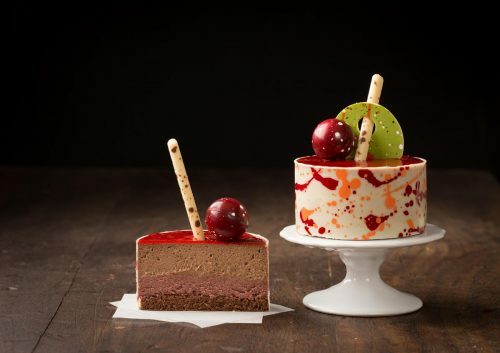 At Ghyslain Chocolatier in Union City, basic tours focus on the production of not only gourmet chocolates but fine French pastries as well; see the delicate process of hand-painting chocolates in vivid colors. The “Make Your Own Chocolate” tour provides lessons on making an edible chocolate tulip cup that you fill with chocolate mousse, decorate and devour. In Edinburgh, groups get in some tasting during the factory tour at Not Just Popcorn, which makes more than 240 popcorn flavors, including dill pickle and chocolate mint cappuccino. The retail store is next door. In Merrillville at Chicagoland Popcorn, the “Popcorn Flavor Superstore,” the top seller is the Chicagoland Mix, a combination of cheese and caramel popcorn. New among the 125 flavors are Chicken Bacon Ranch and Jalapeno Spinach Dip. Across the road is the massive Albanese Candy Factory, a colorful wonderland where free group tours show the “World’s Best Gummies” and other treats being made right before your eyes, samples included. For something a bit nontraditional, make a trip to Newfangled Confections in Indianapolis and try the Frittle. As they say, “This ain’t your grandma’s brittle.” Frittle combines the peanut-buttery sweetness of brittle with peanut fudge. The result is a “kinder, softer brittle” with a crispy-creamy texture and just a hint of salt. four generations ago. See bees making honey in a live observation hive and catch bottling and candle-dipping demonstrations. You can even bottle your own honey. At the southern end of the state is Santa’s Candy Castle, an enchanting store in the town of Santa Claus. 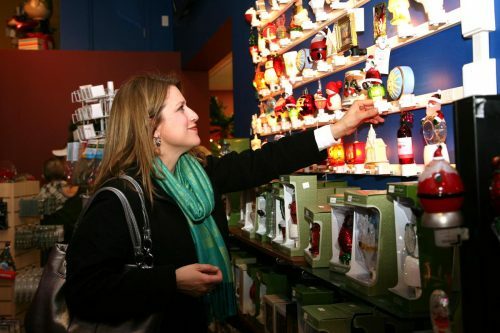 Piped-in Christmas music, from “Jingle Bells” to “Come, All Ye Faithful,” greets guests, who find freshly made fudge, blast-from-the-past candies, and entire sections devoted to Jelly Belly and Pez. Frozen hot chocolate, the shop’s specialty, comes in 33 flavors, including salted caramel, gingerbread and roasted chestnut. 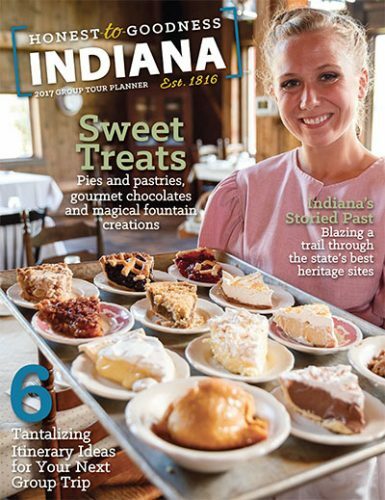 With all the yummy treats being turned out by factories and kitchens in towns big and small, every day can be a holiday on a tour through Indiana. Throw calories to the wind while indulging on the road—and, for icing on the cake, be sure to bring some goodies back home as sweet memories of your trip.